Bonding Tips fit into the hand held Bonding Iron or Circuit Bonding System. The bottom machined surface of each Bonding Tip is used to apply heat and pressure to bond adhesive backed replacement lands, pads and edge contacts to a circuit board surface. All Bonding Tips are machined from high grade aluminum. Tools and materials may be ordered from distributors around the world. See our Distributor List. 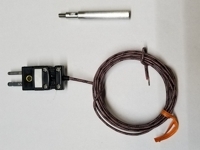 Thermocouple used to calibrate Temperature Controller.